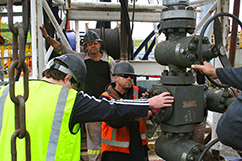 Cheal-E continues to provide good news, with three wells cased as potential oil wells – one of which is being flow tested – and Cheal-E 4 now drilling ahead. To ensure more reliable production forecasting on future wells, we’re following a protocol of initially testing each well individually: with each flowing for approximately 15 days, and then shut in temporarily to conduct pressure and temperature analysis. During this shut-in period, the next well will be placed on a 15-day production test until all new wells at the site have been individually tested and build-up analysis completed. During its initial 5-day flush period Cheal-E1 was testing at 600 BOEs a day, about 90% of that oil, flowing naturally without the aid of artificial lift. We know that will settle down to a more typical Mt. Messenger well average over the course of the next year, but considering the fact that Cheal E represents a substantial extension of our known oil saturation area at Cheal, we’re fully pleased with the results, and happy to be getting the proceeds from the sale of all that oil. (Top) No more flaring to dirt pits for TAG! This is one of our new "flare stacks" with built in containment. Though commonplace in Canada, this is a first in New Zealand. 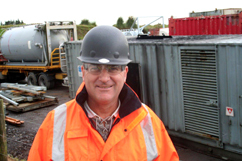 Other New Zealand operators are very interested to see how these work, as are the regulatory bodies in New Zealand. (Left) We’ve added attenuators (mufflers) on top of the power units for Nova-1. These cut the rig noise almost in half, appreciated by neighbors and our team alike. Cheal Production Station flare, which will be sold once the infrastructure upgrade is finished. 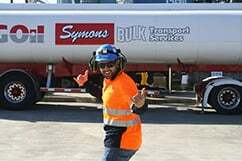 Here’s Jesse, a Cheal operator, enjoying the winter sunshine as TAG tankers "fill'er up." 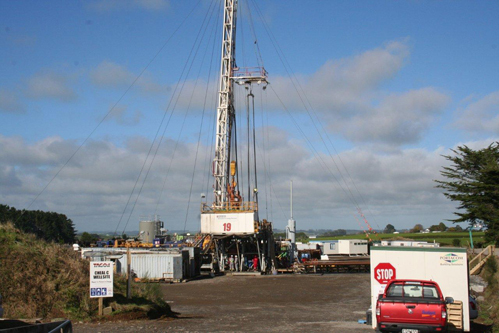 We put together a simple table to bring you up to speed on TAG’s Taranaki Basin oil and gas producing and drilling activity. The table includes producing oil and gas wells, wells in development (some awaiting workover operations as well as improvements in production infrastructure, to bring additional production that’s currently sitting behind pipe, on-stream), and our next condensate targets to be drilled. Status will change quickly, but here’s a snapshot of how TAG Oil's drilling and workover program stands now. Producing 2 to 3 million cubic feet of gas per day (350–500 boe/day), and 30 to 50 barrels of light oil / day. Permanent tie-in completed. 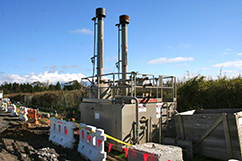 Anticipate 8 to 10 million cubic feet of gas per day once compression installed. 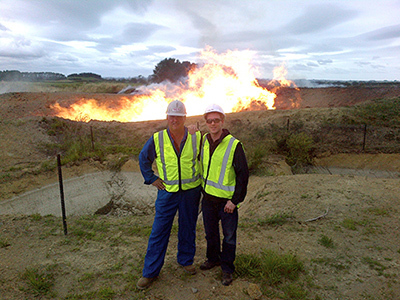 On a recent trip to Taranaki New Zealand, TAG Oil CEO Garth Johnson and Controller Dan Brown snapped some photos for the blog. They were down under for meetings with the technical team and local community leaders, and of course, to experience the new developments at TAG's Cheal and Sidewinder oil and gas discovery areas first-hand. 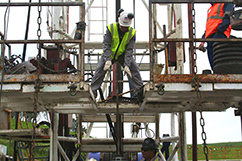 The Ensign Rig getting set up to drill Cheal -B7, TAG's follow-up to the highly successful B5 well. Cheal-B5 had the most extensive pay interval ever recorded by a Cheal well, and the highest flow rate recorded from from a Mt. Messenger well. 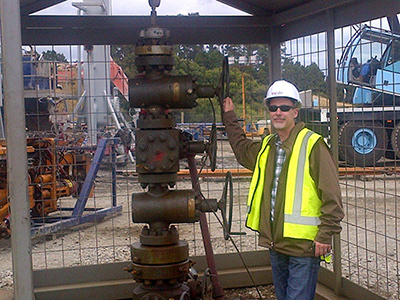 TAG Controller Dan Brown stands proudly in front of the Cheal-B5 wellhead. As announced December 5th, TAG perforated and flow tested 20 meters of continuous oil-and-gas pay in the Cheal-B5 well, in the 35 meters of net pay intercepted within the primary Mt. Messenger Formation. Today it’s still going strong. 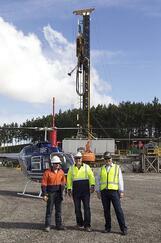 Lead engineer Jack Doyle and CEO Garth Johnson, in front of the Cheal-C2 discovery well. This important step-out well in TAG's C-block discovery area flow tested ~14 million cubic feet per day (~2,333 BOE/day) on a 48/64" choke, with associated condensate production increasing during testing. Located about 3.5 km's NW of TAG's Cheal-B5 well, it significantly extends the known oil-and-gas saturation area within TAG’s Cheal permit. The success of Cheal-C2 also adds another high-impact target to TAG's prospect portfolio in the Mt. Messenger and Urenui formations. 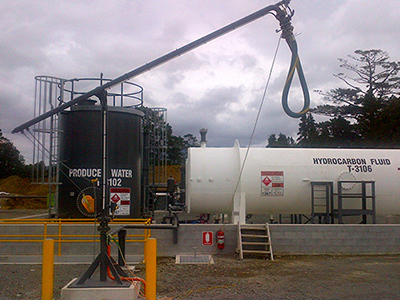 A shot of the loading arm at the Sidewinder Facility: used to fill the oil tank in the background with oil produced from TAG’s successful Sidewinder exploration wells drilled in late 2011. This has been a busy and exciting couple of weeks for TAG at our Cheal permit: in less than 30 days we tested Cheal-B5 (the third well in our current 10-well drilling campaign) and got it on full time production. 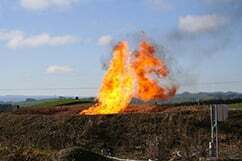 We didn’t know what the results would be at the time of these photos, but after perforation we flow tested 20 meters of continuous oil-and-gas pay within the 35 meters of net pay intercepted in the primary Mt. Messenger target. This is the most extensive pay interval ever recorded by a Cheal well, and includes record porosities of up to 30% and a record 60% total gas kick encountered while drilling. Over the five-day test period, the discovery well was naturally flowing at an average rate of 1,870 barrels of oil equivalent a day, that’s 1,700 barrels of oil and 1.0 million cubic feet of gas per day flowing through a 40/64" choke. These shots are of perfing day. TAG's Carey Davis kisses the firing bar for luck. Everyone grabs something metal on the rig to feel the shots fire. It took nearly a minute-and-a-half for the firing bar to drop the 1700m. Guns just fired…no immediate pressure response. 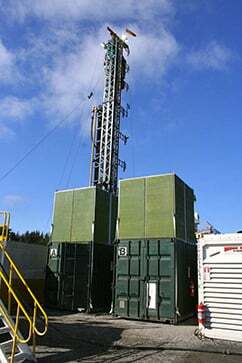 Big gas wells almost always give immediate pressure response. Could it be oil? Waiting nervously for pressure response…and a minute after perforation the pressure starts to build. We knew then the news would be good. 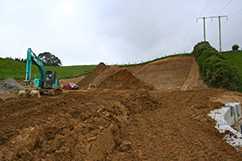 B-Site expansion: making room for more B wells. Cheal-B4ST exploration well gives us a strong flow test from multiple zones. 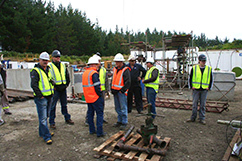 News just how we like it: We drilled the Cheal-B4ST vertical exploration well to 1821m and encountered net pay in both the Urenui and Mt. Messenger Formations. Flow rates averaged 400 BOE per day (360 barrels of oil + 240 thousand cubic feet gas) after the first week of production. 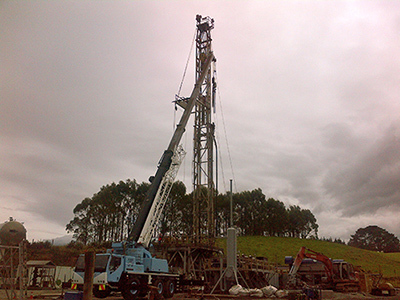 The well encountered 17 meters of net pay within the Urenui at ~1400m and Mt. Messenger at ~1700m. These Miocene-aged zones were isolated and tested separately, confirming oil and gas flow rates from both. 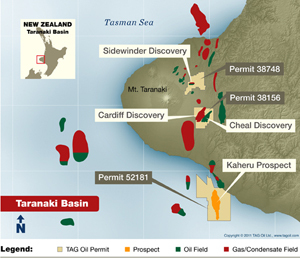 The Urenui test really opens a door on the potential reserve growth of the Cheal oil and gas field, which til now has relied on the Mt. Messenger formation only. The potential for PMP 38156 is just at the tip of the iceberg we hope. 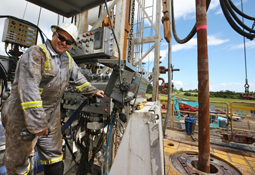 Cheal Exploration drilling with a step-out well. 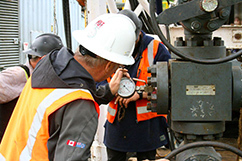 Exploration drilling is set to resume at Cheal; our next target is the Cheal-C1 exploration well, a 3.5-kilometer step-out well to the northwest of where we’re already producing light oil and gas. Cheal-C1 will test the Mt. Messenger (~1800m) and Urenui Formation sandstones (~1400m) ID’d on 3-D seismic and supported by strong bypassed oil and gas shows in the nearby deep Cardiff-1 well (~4000 meters) drilled by a previous operator back in 1995. Positive results from Cheal-C1 will lead to an immediate rig skid on the Cheal C site to drill the directional Cheal-C2 well targeting the same multiple formations located about 500 meters (1640 feet) northeast. 750 barrels a day…and that’s just the beginning. TAG Oil’s PMP 38156 Cheal oil and gas field is producing about 750 barrels of oil equivalent a day…so far. That’s just 4 out of the 9 flowing wells, from the relatively shallow Mt. Messenger and Urenui Formations, with a lot more drilling operations and completion work still to go. With proven and probable (2P) reserves presently assigned to only ~5% of the total Cheal Mining Permit acreage, the Cheal Mining Permit has some solid reserve and production growth potential. Especially if you look at how lightly explored the area is, and the number of perspective producer formations we still have to go at depths of 1400 to 4000 meters. And owning our own oil and gas production infrastructure at Cheal allows TAG to control the timing of operations in case we want to fast-track any production arising from additional successes. There’s a lot of work ahead, but all in all it’s a good spot to be in. 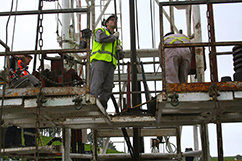 Sidewinder-4…another oil and gas strike. Fortunately, this kind of news never gets old. The Mt. Messenger sandstones and PEP 38748 continue to pay off. The interpreted total hydrocarbon column at TAG's Sidewinder discovery now exceeds 60 meters in thickness, with no water column evident in any of the Sidewinder wells. The Sidewinder-4 well, sidetracked to a location down-dip of Sidewinder-3, targeted a fault-bounded 3-D anomaly which intercepted a gross 29 meter-thick sandstone reservoir. Total depth is 1410 meters with 19 meters of net oil-and-gas-charged sandstones; electric logs indicate hydrocarbon charge to the base of the sandstone. Free oil was observed over the shakers during the drilling operation from the target zone, and consistent with all of the Sidewinder wells drilled to date, the oil-and-gas-charged sandstones encountered in Sidewinder-4 have excellent porosity and permeability.